The highly popular, fast-paced American Poker II™ is now also available on the sophisticated "Generation5" gaming platform. 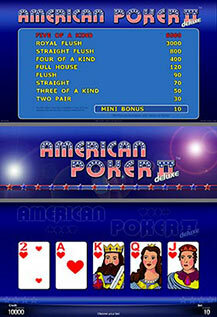 American Poker II™ deluxe uses a standard deck of 52 cards plus 1 Joker card. The Joker card substitutes for any card. The player places a bet for the 1st hand deal and can then choose to buy a 2nd draw. The win combination ‘Jacks or Better’ is only paid if a 2nd draw is bought. This Poker game also features a Mini-Bonus. This is a pot which is filled by win combinations of "Jacks or Better" and is awarded once the pot reaches a certain amount.